The truth is haters come a dime a dozen, and any and everyone can (and probably does) have some. There’s nothing special about someone that refuses to show you any love or support due to jealousy or other shallow reasons. Yet, in this day and time haters are celebrated and more significant than even the influential, supportive people in our lives. Shoutout and focus on the people that help to bring out the best in you instead….the people that support and lift you higher instead of trying to bring you down. Love on those that cheer for you when you win, instead of listing and spotlighting those that are waiting for you to lose. The truth is this: you lose when you focus too much on the very people that want you to lose along with them. 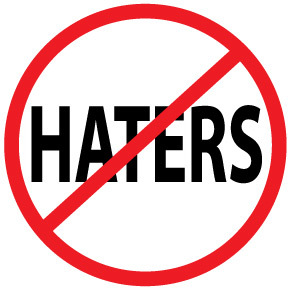 Make the rest of this year a hater-free zone, and hopefully this practice will turn into a lifestyle change. Let your haters watch you win in peace.